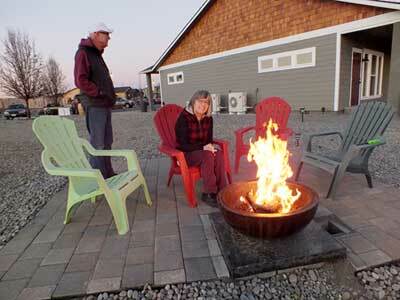 Zillah Lakes Inn is open for business, but the project still has a long way to go before the full vision is realized. Four of the seven rooms in the new Yakima Valley Highway boutique hotel have been available since mid-November, and owners Doug and Pam Lakman are planning to offer three more rooms by next month. A little further down line, the Zillah Lakes Inn Yakima Valley — originally called Zillah Oakes Inn as a tribute to local pioneer Thomas Oakes — will feature a second building complete with five guest rooms and a community kitchen. The Lakmans are glad to have the grand opening behind them, though the next few weeks could prove a little hectic, holiday plans notwithstanding. The Zillah Lakes Inn in the heart of wine country, just minutes from a variety of vineyards and tasting rooms. The 3,000-square-foot property overlooks a small fishing lake stocked with 5-pound bass and offers views of Mount Adams and Mount Rainier. Outdoor activities abound, with walking trails, bicycling and golf all available on the grounds. Even in the winter months, guests can enjoy their stunning natural surroundings while sitting by a lakeside gas fire pit. In addition to the obvious natural amenities, the inn itself offers ample reasons for an extended visit. Oversized rooms, high-quality furniture, luxury vinyl flooring and large windows are just a few examples of the higher standards the Lakmans have introduced. Six of the existing rooms are 450 square feet, and the seventh is an 800-square-foot master suite designed for longer stays. Guests can also enjoy free Wi-Fi, flat screen televisions with a full cable lineup, in-room refrigerators and complimentary laundry services. Almost everything you see at Zillah Lakes Inn was purchased in the Yakima Valley. Aside from being comfortable and contemporary, the Zillah Lakes Inn also features environmentally friendly technology such as solar panels, air-infused showers and high-efficiency lighting. Barrels will also be stationed below the gutters to recycle rain water. “The idea wasn’t to be green as much as it was to be modern,” Lakman said. The hotel’s many attractions are an obvious selling point, but in the end, the Lakmans believe service is what will set them apart. They don’t want to be a bed-and-breakfast, but they want to get to know their guests. If someone wants to tour downtown, they will offer to be a tour guide. If they want to go wine tasting, the Lakmans may join them for a glass or two. Maybe you want a fishing guide? They will accompany you to the lake and bring their own poles. The owners also credited the Zillah Lakes development group, the city of Zillah and a long list of local residents for helping them launch their new venture. 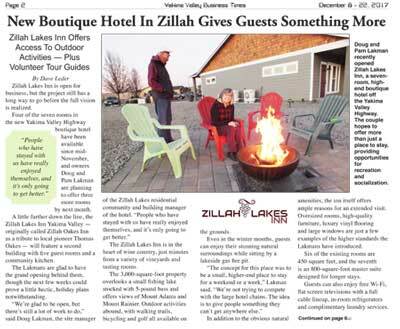 The Lakmans believe the Zillah Lakes Inn is already adding some flavor to the Lower Valley. “The people of Zillah have been wonderful, and the guidance we have received will ultimately make this place better,” Lakman said. To learn more about the new boutique hotel, visit www.zillahlakesinn.com. Download the full article in PDF. © Yakima Valley Business Times. Reproduced with permission.